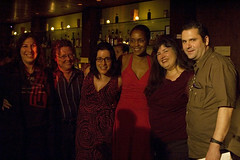 Left to right: JD Glass, Radclyffe, me, Jolie du Pre, Jay Lygon, Michael Luongo. Lots of people were taking our photo at the same time, so that's why we're not all facing the same direction. THANK YOU to everyone who read and everyone who showed up! And, of course, to Brian Van for this photo and this set from the evening.